The offshore wind company Vineyard Wind held an open forum with the public to hear concerns and questions about their proposed 800-megawatt turbine facility. The company is looking to place over a hundred turbines in federal waters about 15 miles south of Martha's Vineyard and Nantucket. At a meeting in Hyannis, members of the public were invited to voice any issues they might have around the new project. Along with the Bureau of Ocean Energy Management, the company gave updates on the permitting process and potential sites they were considering for connecting the turbines on shore. Three proposed onshore locations include sites potentially in Yarmouth, at Covell's Beach in Barnstable or Lewis Bay. While many at the meeting were supportive of the project, West Yarmouth resident Angela Carbone said she was concerned over the turbines potentially coming ashore at Lewis Bay. "It’s in tough shape right now in terms of the water quality and I’m afraid that one of the routes would damage the bay further, perhaps even kill the bay in terms of marine life and putting the cable through there would be a big mistake," she said. And Jim Kendall of the Massachusetts Fisherman’s Partnership said that many fisherman were also worried about how the new turbines may impact already stringent fishing practices. "Just navigation through these things, now you’ve got yourself a monstrous wind tower or a hundred of them, you’re trying to navigate through a field like that... The navigation process, that’s the first thing, let alone trying to fish within those areas," he said. He added that he and many fisherman saw the move towards off shore turbines as inevitable, and that he was hopeful he could encourage the company to partner with the fisherman in making sure neither the energy industry nor the fishing industry were harmed. Vineyard Wind will be conducting an environmental survey of the different on shore locations they're considering beginning in the next few months. If the project is approved and permitted, construction on the turbines would start in late 2019, and finish at the end of 2021. Massachusetts is pushing hard on the renewable energy front, with more than 1600MW solar installed and a target of 1600MW offshore wind energy by 2020. Since sunshine and wind don’t always match consumer demand for electricity, the Commonwealth has set a goal of 200MWh of energy storage capacity by 2020, and is putting more than $10 million into energy storage research and demonstration projects. New England’s energy system is at a crossroads. Economics and climate concerns are driving a shift away from coal and oil, but experts remain divided on where to go from here. If you want to get a sense of New England’s energy systems – past, present, and future – Sandwich is a good place to go. It’s the oldest town on Cape Cod, founded in 1639. The Cape Wind project has been ongoing for more than a decade, and the developer says the first of the 130 wind turbines could he installed in Nantucket Sound by early 2015. 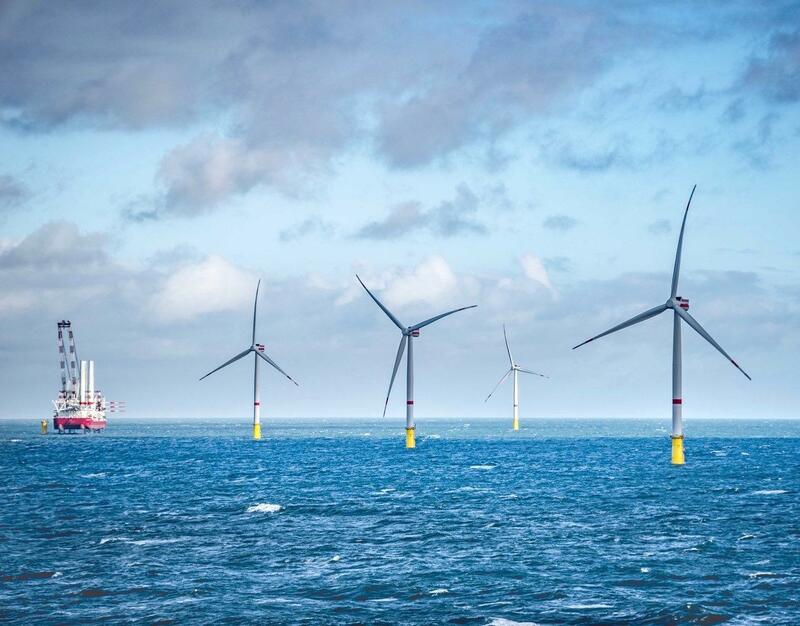 Outside Massachusetts and along the entire East Coast, interest in offshore wind continues, as projects enter the planning stages in states such as Maine, Rhode Island, and Delaware. But these offshore turbines are massive in scale, hundreds of feet high with footings that go deep into the seabed. They require complex port facilities to assemble, transport and install the enormous blades and towers.